2005 shows a very large increase in income concentration: the top 1% gains 14% in real terms from 2004 while the bottom 99% gains less than 1% (when including capital gains). The [previous] record peak of 2000 is surpassed even though 2005 is less of a high capital gains, high stock option year than 2000. By 2005, it looks like top incomes are showing strongly along all components: wages, business income, dividends, and capital gains. Greg Mankiw's Blog: New Data on Income Inequality: Paul Krugman calls attention to the update of the Piketty-Saez data on income inequality, although Paul describes the data differently than I would. Here is what I see: After rising substantially from 1986 to 2000, income inequality is essentially the same in 2004 (the most recent year of data) as it was in 2000. Greg wrote this last year, before the IRS issued the data underlying the 2005 data point [shown in the graph above]. I expect the usual cast of characters will show up on the op-ed pages in predictable places with the same old tired attempts to rebut this evidence. But the question is not about whether inequality exists, or whether it is rising. The data are clear on this point - inequality is increasing. 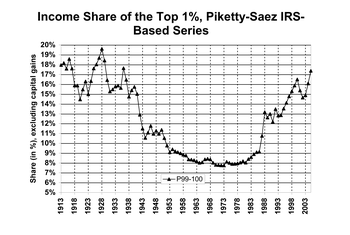 To me, the question is why inequality has been rising, i.e. the source of the increasing wealth accumulation and what, if anything, we ought to do about it.